﻿ Da Nang Riverside Hotel (Vietnam) | FROM $37 - SAVE ON AGODA! "We enjoyed the location for the Dragon Bridge ceremony and s..."
Have a question for Da Nang Riverside Hotel? "Good location beside the Dragon Bridge, restaurants and a 15-minute stroll from Vincom mall." "Slightly faded but comfortable rooms, a decent buffet breakfast with an egg station, pho and lots of Asian dishes (6-9am) and a big ground-floor pool." "Location is good, lot of cafe, restaurant nearby." 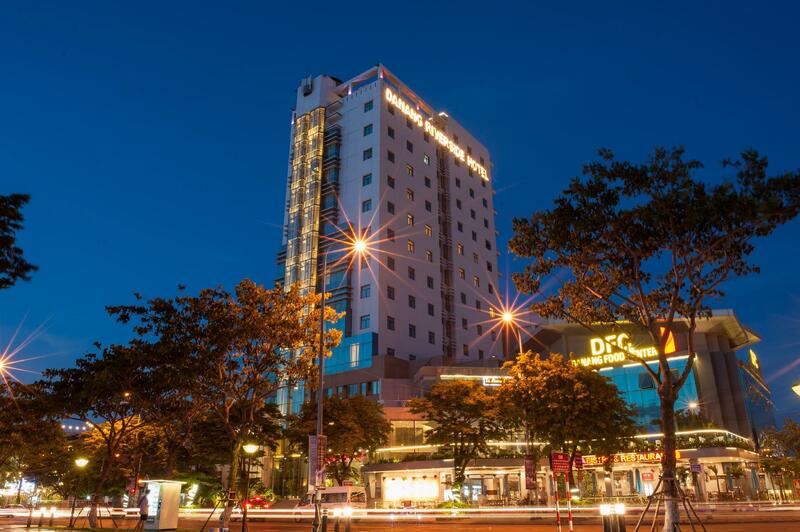 Situated in the heart of Da Nang and overlooking the Han River, Da Nang Riverside Hotel is just two kilometers away from the international airport and railway station. It is within close proximity to popular attractions like Cham Museum, Son Tra Peninsula and beautiful views of Marble Mountains, and beaches for those that are in need of leisure. Boasting 96 rooms completed with excellent facilities that are flawless for a 3-star hotel, they have good interior decorations of rooms and restaurants. They also feature a phone, in-room Internet communications, and excellent guest services. Indeed a good 3-star property, Da Nang Riverside Hotel is definitely worth your stay. "This hotel is so nice to stay"
Very disappointed with this hotel. Gym is so small and bad and outdated. Wifi was a nightmare, keep breaking up and can’t even watch movie on my iPad or Skype. Staffs are so weak in terms of no initiatives on work and not helpful and slow. Four days breakfast all same food exactly which is not suppose to be. Very very bad experience and will not revisit again for sure. Location is quite good on opposite side of Dragon bridge. Can even see Dragon fireball from room on weekends . Breakfast is 6am to 9am . It made us inconvenient bcos we are night owls. As a vacation, we wanted to get up late. There is a bath tub in room but no close to maintain water in tab. We used shower cap not to drain out water. It is so bad. Room is quite big. But the safety box keep beeping whenever I open the closet. It's annoying. Can control all the power supply and tv from keys on side desk. It is quite convenient. Thank you for your trust in using services and suggestions for Da Nang Riverside Hotel. We will try to improve further in the future. Hope you have a great holiday! We hope that we will have much chances to welcome and serve you again if you go to Danang city in a nearest day. Warmest greetings from DaNang Riverside Hotel! Hotel location exactly in front of Dragon Bridge. So we can see clearly from our room when dragon head showering water and Fire without need to go out from the hotel. Room is very simple but clean, Staff are friendly & so many vietnamese food during breakfast. Room size, price, and the view of the River. this is a great hotel it has all you need to enjoy your stay on the premises the only problem is that at present it is on the quiet side of the river. there is a bridge being built about 200m away but it is not done yet. i personally enjoyed the area very much it far less tourisic and very friendly we met many amazing people. the "fashionable" side of the river is about a 20 minute walk. or a 10 minute taxi ride. Nice place away from the busy city but just a walk over Dragon Bridge away. At time I stayed mainly Asian customers, hence food (breakfast) influenced by this but so much choice(Asian). Night markets so close and open most if not al nights of the week. An old hotel with broken toilet fittings and shower. The hotel says- they can not fix. Very congested room for 3 pax. Extremely expensive yet worst Break fast for vegetarians. Nothing is there for vegetarian people- they even do not understand what vegetarian food means. Staff does not speak English. No water in room. Fruit basket poor quality. Awesome views of the dragon bridge.. located on beach side. City centre is just over other side of bridge. Breakfast was just ok. Staff at reception were helpful. We went for a swim in the pool at 1pm and they stopped us - pool boy put chemicals in. Abit odd to be doing chemicals at 1pm considering this is the middle of the day. Good $65aud a night hotel. Pro- near Dragon Bridge one of the famous attraction in Danang Cons- No room service, water tap & shower broken & bath tub was loose (did not attach well with the fixture). Just stay at the hotel for 1 night &did not bother to call for maintenance. This hotel deserve a 3 starts rather than 4 stars. We enjoyed the location for the Dragon Bridge ceremony and so much more. A great value for the money with a very accommodating and friendly staff. Good breakfast, comfy beds and well facilitated all the way around. I would recommend Da Nang Riverside Hotel to all. Great view, can see the dragon bridge nicely, as well as the "fire breath" every Saturday and Sunday night. Location is good, lot of cafe, restaurant nearby. Staff can understand little English, but is fairly enough. Hotel is a bit run down, but consider the location and price, is very much value for money. We stayed in this hotel in the first day of the trip in Vietnam. It is close to and center of the city. Relatively close to the airport, which good for us since we need to catch a plane on next day. The lobby manager is very thoughtful. She called a private car to send us to the airport for free. Saved us time and money. Some part of the hotel is still under rennovation. The room is not in very good condition but the view is good for seeing the han river. The hotel iis old and they are renovating the lobby and part of the hotel so the front part is quite messy. The room is big but need upgrading. The bathroom handle kept on falling apart, and the shower is crap. Restaurants are non existent, and the breakfast is of poor quality and limited choices. Staffs are friendly and helpful. Would rate it 2 stars. We were not told about the extensive building work. The music at breakfast was too loud & poor taste. Generally the music in the lobby was too loud & poor taste. Breakfast only catered for Asian taste, no cereal no good bread. Too noisy from the construction work & terrible music especially at breakfast & reception. Was not told that work was being carried out. Asian breakfast did not cater for western tastes, no cereal no yoghurt no nice bread, toaster broke down. Table cloths filthy. Poor sound transmission from rooms above & from sides. For some reason this hotel doesn't get great reviews, but it actually is much better. The location to Dragon Bridget is outstanding if you get a river view on the upper floors. On the weekend you have a front row seat to watch the dragon spew fire and water at 9pm. We probably had the idea room as it was at the end of the hall with windows on two walls, both facing toward the Dragon Bridge. A decent breakfast buffet compared to most others; large rooms, great views toward river, and decent value for your dollar. On the downside, the bathroom and shower were not my favorites. The comfort of the bed was average at best. Most of the nightlife is on the opposite side of the river, so you will need to take a taxi or brave-it walking the streets. But all in all, this hotel will remain on my list for future stays. I recommend this hotel for your consideration. Overall, good stay. Spacious Room, Nice View with river, Buffet breakfast, swimming pool. Though there are two negative things and our complaints are there. 1. Unrealistic clothes washing price At all of other same level hotels in Vietnam, they offered washing per kg price and it was realistic, this hotel charged per clothes and rip off price. Ended up with unrealistically expensive washing. 2.One of their security staff attitude We knew there's no tip culture in Vietnam though we gave 10k tip the security staff after he took us to our room and he said "it's not enough". Thinking of the Vietnam price and no tip culture, it's enough. This is not 5 star hotel. Also when we are catching a taxi to Hoi An, the same staff said "it's cheaper to use our car". Then their car was not available so we caught normal metered taxi in front of this hotel, and found out that normal taxi was much cheaper. And when we arrived at Hoi An, the metered taxi driver insisted to receive the hotel car price; said he was told by the staff to receive hotel car price. These two things damaged our good feeling toward this hotel, everything else other than these were great for the money. loved the pool, and the quiet coolness of the room. We stayed in the regular rooms, across the lane from the pool, rather than the bungalows. I think that was a good choice given the popularity of the pool. Awesome buffet breakfast with local and Western favourites, was plentiful, and a good start for the short walk across the bridge to where all the action is. Rent bikes across the street, and pedal off to the beach for the day, and be nearby all the restaurants at night.